I get that. Work is a blessing. I spend most of my waking hours working, and I value it enormously. That helps me to realize what a tragedy it is that so many people are out of work. Officially unemployed, functionally unemployed, too discouraged to keep looking, missing the focus that work can provide, and even more, missing a sense of worth, value, purpose. That’s a financial crisis, in most cases, but it’s also a profound emotional and spiritual crisis. When an economy cannot produce jobs for people willing to work, something is terribly wrong. When some people are paid outrageous sums for work that contributes little or no value to society, and millions who have useful skills cannot find work, something is wrong. We aren’t made for idleness, but for building, helping, trying, risking, doing what needs to be done. Q: I am curious as to how the polity models of Occupy Wall Street might be a harbinger of future polity models for churches. A: Interesting question. As I understand it, Occupy Wall Street is a protest that is trying to remain leaderless, where every voice can be heard and, over time, the swelling of voices will unleash energy for change. It seeks to engage people, to heighten awareness both on the ground and elsewhere, to free people to speak up against those who oppress and cheat them. It doesn’t have an action agenda, except possibly to avoid being co-opted by celebrity hounds, politicians chasing photo ops, and fringe elements wanting a stage. I see faith communities doing much the same work, but with the added element of doing mission, doing ministry, doing change. For that “doing” agenda to happen, churches need to be transforming lives – work that OWS would understand – and to be organizing for action. In that bias toward action, as opposed to awareness, faith communities need strong, assertive leaders. Not hierarchies, not dictators, but strong, assertive clergy who can lead God’s people toward changing their lives and thereby setting out to change the world. In that way, OWS doesn’t model what churches need. 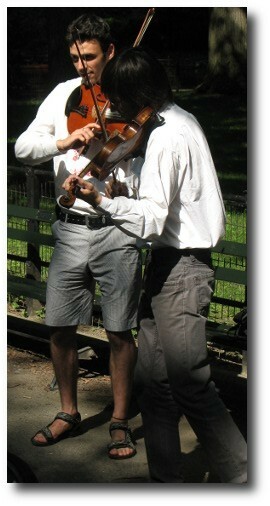 Photo: Two buskers playing folk music on the Mall in Central Park, among thousands of out-of-work artists who work for contributions.